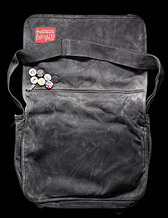 Check out Eric Gillin’s piece The Bag at Esquire.com. The story about the bike messenger bag he was wearing as he stood near the World Trade Centers on 9/11 makes the moments after the towers collapsed vivid yet again: terrifying, certainly, but Gillin laces the story with surprisingly humorous details(the women in the basement he takes refuge in swapping Valiums and Xanax, his irritation at the post-collapse symphony of car alarms). And the perilous physical and emotional aftermath of being swallowed by the ominous cloud of dust comes to life. Lest the subject matter seem too grim, I suggest choosing the option of listening to Eric read his story; his cheerful, good-natured voice consoles you that he is in fact okay, as the story itself does in the end. This one isn’t about grief, and it's certainly not about self-pity, it’s about expiation. Eric’s moved over to Esquire from Maxim, and is editing the newly launched Esquire.com, a stand-alone offshoot to the mag. If the Maxim-to-Esquire transition seem an odd, low-to-high jump you probably never read Maxim. The entertainment stuff there-Eric’s domain-was wildly clever, irreverent and intelligent. And Esquire’s not so noble and literary after all-one issue after another features a tarted-up actress on the cover, just like Maxim. Actresses are made to look like hookers on both mag’s covers, they’re just the more fun kind of hookers in Maxim-land. They’re putting out some great stuff at Esquire.com, including the backstory on the Geico Cavemen, an article I wish I’d written. Now I dont' have much of an appetite. The good news: I may be doing an interview with Aiden Shaw. The bad news: it would be conducted online. So much for living out a fantasy that begins "As he reached across the table and turned off the tape recorder.."
Aiden, Then and Now. Like a fine wine, this one. The Most Glamorous Photograph Part One. The Rowan Brothers ride through Central America. On motorcycles. A grown up bar in the midst of hipster Williamsburg, with proper cocktails at approachable prices. Rogue Cocktails has transformed into Beta Cocktails, a collection of improbable, bold & innovative concoctions. You're in capable hands with the charming Miss Flighty, as she talks you though how to get that cocktail just right. Comprehensive and quite cool cocktail resource. David Wondrich's indespensible online resource for cocktail recipes and lore. Well written blog on Melbourne and Sydney bars.